In-plants that excel at promoting their services deserve special recognition. At the In-plant Printing and Mailing Association conference in June, the University of North Texas got that recognition when its Printing and Distribution Solutions operation was honored with the 2015 IPMA In-House Promotional Excellence Award. 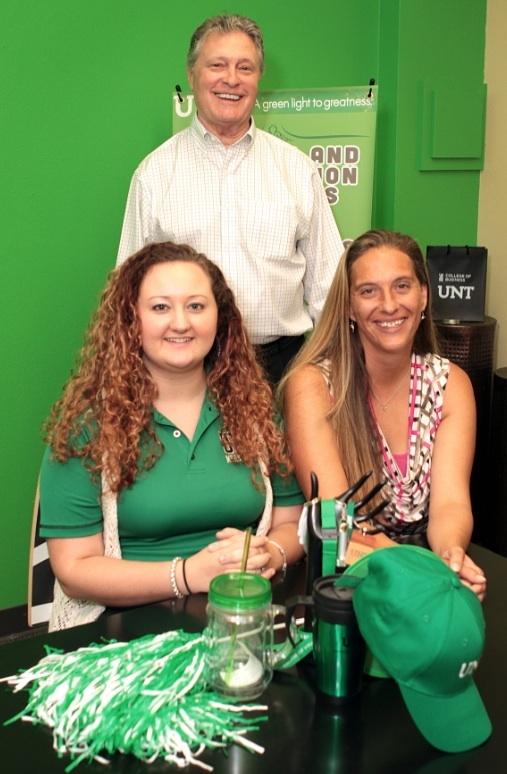 Overseeing promotional products at UNT are Bernie Emmons (standing), promotional marketing manager, Kendall Martin (left) and Tammy Johnson, promotional sales specialists. Highlight a particular item through “featured item” promotions. Make suggestions about how promotional items can be used. Draw attention to the fact that customers can order as many or as few items as they need, including single orders. Point out that ordering directly from UNT Printing and Distribution Solutions brings cost savings for customers. Then, to raise awareness of the shop’s promotional products and position the in-plant as the best vendor for promotional items, the team decided to run a workshop. “We decided the best way to accomplish our goals was to educate our customers on best practices in the purchase of promotional products and personally guide them through the online shopping experience,” explains Lora Connaughton, director of Printing and Distribution Solutions. The campaign was a resounding success, resulting in an overall increase of 297 percent in the sales of promotional items. First the team reached out to a large group of administrative assistants by giving a presentation at the assistants’ quarterly meeting, combined with a UNT trivia game to make it fun. Then Printing and Distribution Solutions built a carefully chosen target audience and sent a series of email blasts designed to encourage registration for the workshop. “Our target audience was built from registered users of our online storefront,” explains Connaughton. The list comprised marketers, event planners and student-focused departments, and included those who had traditionally ordered their promotional items off-campus. In addition, the team reached out to departments that had not been making use of promotional products and showed them the benefits of including such items in their marketing. Initial emails, personalized with each recipient’s first name, were sent out three weeks prior to the workshop. Recipients who chose to register did so via a registration page, which allowed Printing and Distribution Solutions to capture useful information. They also received a reminder email with details of the event. Automatically generated notification emails allowed the team to keep tabs on registration numbers and event interest. A final email was sent out two days before the workshop to remind prospects that it was nearly time for the event and to provide them with the agenda for the day. Attendees received handouts on how to use promotional materials effectively along with branding guidelines, and they were able to browse a selection of the new branded products from apparel to mugs, letting them see the quality and range for themselves. They watched a slideshow, got a website tour and learned how to make an order or request an estimate. 50 percent of participants purchased promotional items within six months of the workshop. Sales of promotional products purchased by attendees within six months totaled $35,433. Sales increased 1,345 percent over the previous six-month period from those who had attended the workshop. After the successful workshop, sales of promotional items were high enough that UNT Printing and Distribution Solutions added an experienced marketing specialist to its team. In addition to the administrative assistant who was already acting as the go-to person, the team assigned another assistant to ordering, meaning that three staff members are now dedicated to promotional product sales.